An Indian in space in 2013. 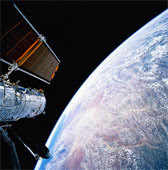 India and Russia will launch a joint manned mission to space in 2013. After Rakesh Sharma an ISRO staff will be the second Indian to fly into space. Kalpana Chawla and Sunita Williams were other two astronauts of Indian origin to go to space. Sunita Williams returned safely from space while Kalpana Chawla's space shuttle Columbia crashed killing her and her crew members. Moon having iron minerals ? Chandrayaan -I 's succeess continues as a Nasa payload on board has revealed some aspect's of moon's surface through Moon Mineralogy Mapper that was inaugurated on 22nd November 2008. Nasa says the details beamed by the M3 throws light on changes in the rock and mineral composition of the moon and also abundance of iron-bearing minerals such as pyroxene. M3 was the the first instrument to provide highly uniform imaging of the lunar surface and it also provides us with compositional information across the moon. Astronomy is the study of space objects such as planets, galaxies and stars. Some people do it for a living, others just to pass the time. That's why when a web site or magazine offers an astronomy picture of the day it's likely to attract a great deal of attention. There are plenty of such pictures to choose from, and plenty of interesting objects out there to keep people looking.The first place to look for and astronomy picture of the day is NASA's website. This site NASA.gov shows a new image each and every day. It also has a multimedia center with video and images. These could be great sources for a person to create their own site that offers a new image each day. On November 5, 2008, NASA's picture of the day was a close view of Saturn's moon, Enceladus. It was taken by the Cassini space craft as it passed about 1,700 kilometers from the surface. It gets down to details the size of the bus. One interesting feature of the ice on Enceladus is that it reflects 99% of the light that falls onto it. Talk about bright. The moon is so interesting that Cassini will continue to fly by for more images later in its mission.NASA maintains an archive of all the astronomy photos of the day dating all the way back to June 16 of 1995. It was a representation of the earth as if it were as dense as a neutron star. This photo was created by the computer. It shows Orion visible twice. That's because a neutron star is dense enough to bend light from behind it to the front of it. This distortion causes double images of some objects.September 8, 1995 brought a very interesting image of the central part of our own Milky Way galaxy from the NASA COBE Satellite. This image would normally not be visible because the dust in the galaxy obscures it in the visible spectrum. But COBE scans in infrared, so produced the amazing image of our very symmetrical galaxy.The astronomy picture of the day was the same on January 1, 2000 and January 1, 2001. That's because most people believe the year 2000 was the first year of the new millennium. However the third millennium actually began on January 1, 2001. For many people astronomy is an interesting science filled with many astronomy fun facts. Everything from the size and temperature of our own star, the Sun, to the makeup of distant planets is recorded. People can get a lot of enjoyment from all of this data.There are many astronomy fun facts about this sun. Our own star that supplies our heat and light is between 91 and 94.5 million miles from Earth. Our orbit is elliptical. The distance between us grows larger and smaller throughout the year.The sun is only average size for a star, yet it's size is another terrific source of astronomy fun facts. It's contains 98% of all the stuff in the solar system, even though it's not large for a star. Everything else, counting the earth and all the planets, is a tiny 2%. It would take about 100 Earths to make it across this average sun. The solar wind produced by the sun extends to about 50 times the distance from the Earth to the sun from the sun. In other words those solar winds go out about 50 AU's, with an AU being the distance from the Earth to the sun. What about astronomy fun facts that don't have to do with the sun? How about the moon? In the entire universe man has only walked upon the earth and the moon. And one human man actually traveled to the moon but never left it. There are more astronomy fun facts about the moon. It's the site of what may become the oldest footprint. Neil Armstrong's “giant leap for mankind” left a print in the moon dust that will like still be there in 10 million years. The astronauts who walked on the moon wore suits that weighed 180 pounds on earth but a mere 30 pounds on the lunar surface. Astronomy fun facts aren't limited to our close neighbors. Stars bring the past to life. It can take millions of years for light from some stars to reach us. It could be that some of those stars blinked out long ago. The number of stars in the sky is expressed by a one with 22 zeros following it. Astronomy is a serious professional business and enjoyed by people who are enthusiastic to know about it.. There are millions of information about astronomy every month which are published in their magazines . In the UK many people read Astronomy Now. It's been around for 20 years and caters to both hobbyists and the professionals. In addition to standard articles there are focus features that give the whole scoop on certain aspects of astronomy. Reader images, star charts and book reviews are standard in every issue of this magazine. Not only does the website include much of the same information, but the star charts there are in an even more useful format. The sky can be shown for any month, period of the month (early or late,) time and at various magnifications. It's a real help to anyone with a telescope. Sky and Telescope is an important magazine on astronomy. The magazine includes stunning images of outer space objects and phenomenon. One exciting piece of imagery Sky and Telescope delivered in November of 2008 was images of a planet orbiting another star. One of the first websites people find when searching for astronomy magazines is the website for Astronomy. The website for example carries images of the first ever solar system seen in visible light. Also posted is an audio tour, in the form of a podcast, of the constellation Cassiopeia. The magazine is also well-known for its guides that include tips and tricks for kids who want to start with astronomy. Both the print magazine and website are of top quality. You can also get information about astronomy for free from internet.